When the mercury drops, the Jalapeno rises to the occasion. A true backcountry glove, the Jalapeno is loaded with Thermal.Q™ Elite -- the warmest synthetic insulation, ounce for ounce, ever made – strategically allocated so it’s thickest on the back of your hand where you need it most. The two-stage gauntlet cuff cinches tight with a cyberian cord lock designed for easy, one-hand operation, while ladder lock seals in the heat. 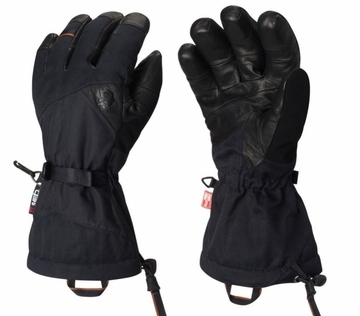 The pull loop makes it easy to pull your gloves up snugly. Tough nylon shell reinforced with goatskin leather fingers and palm to resist abrasion. Pre-curved finger design conforms to the natural articulation of your hand. Each finger’s curve – including the thumb -- has been individually engineered to conform to the way your hand articulates. And when things get really wet, you’ll appreciate OutDry®, a breathable membrane bonded directly to the shell fabrics to fully seal out water, wind, and cold.